Traditionally, caloric requirements during pregnancy have been estimated to be around an additional 300 calories per day. However, this must be adjusted for physical activity and prepregnancy weight (see accompanying figure) for the recommended number of servings of food groups). To meet weight-gain recommendations, a woman with a low prepregnancy BMI and a high activity level would require more calories than a woman with a high prepregnancy BMI and a sedentary lifestyle . A variety of foods from all food groups is important, since foods within the same food group do not contain exactly the same amount of nutrients . If increased weight gain is recommended, an emphasis should be placed on high-calorie food group items that contain a higher fat and sugar content. When less weight gain is recommended, women should choose from the lower-calorie food group choices. Recommendations regarding sugar intake for pregnant women depend on weight gain and maternal blood glucose levels. A high sugar intake would not be advisable for women gaining more than the recommended weight or for those women who are having difficulty controlling normal blood glucose levels, while a high sugar intake would be beneficial for women requiring increased weight gain. A high sugar intake for women who are experiencing excessive weight gain or having difficulty maintaining normal glucose levels could result in increased maternal risk for complications associated with too much weight gain, such as diabetes , hypertension , premature delivery, and a large for gestational age fetus. 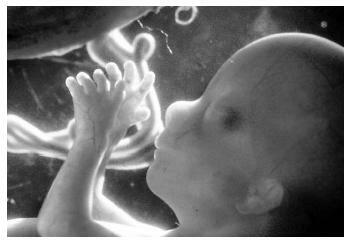 This human fetus is in the second trimester of development, a time when fetal weight gain begins to accelerate. Pregnant women should increase caloric intake by approximately 300 calories per day to account for rapid fetal growth. Calcium and iron supplements may also be necessary. Iron is the only recommended nutrient for which requirements cannot be reasonably met by diet alone during pregnancy. Thirty milligrams of ferrous iron is recommended, and iron should be taken on an empty stomach. When more than 30 mg of iron is given to treat anemia , it is suggested to also take approximately 15 mg of zinc and 2 mg of copper, since iron interferes with absorption and utilization of these materials. According to some studies, caffeine decreases the availability of certain nutrients, such as calcium , zinc, and iron. Current recommendations, therefore, include limiting the consumption of caffeinated containing products. Calcium supplementation may be suggested if the average daily intake of calcium is less than 600 mg. Calcium intake is of particular concern among pregnant women under the age of twenty-five, since bone mineral density is still increasing in these women. Calcium supplements, if recommended, should be taken with meals. Additionally, vitamin D may be necessary if sunlight exposure is minimal. For vegetarians, the current recommendations also include a daily supplement of 2 mg of Vitamin B 12 . For women who don't ordinarily consume an adequate diet, or for those in high-risk categories (such as those carrying twins, heavy smokers, and drug abusers) a prenatal vitamin supplement is recommended, beginning in the second trimester. The supplement should contain the following: iron (30 mg); zinc (15 mg); copper (2 mg); calcium (250 mg); vitamin B 6 (62 mg); folate (300 mg); vitamin C (50 mg); vitamin D (5 mg). Symptoms of toxemia of pregnancy, also known as preeclampsia, include swelling ( edema ) and proteinuria (excess protein in the urine). The cause of toxemia has not been determined, but the risk is associated with first pregnancies, advanced maternal age, African-American ethnicity, and women with a past history of diabetes, hypertension, or kidney disease. In severe cases, delivery is frequently induced. Tips for common pregnancy discomforts include avoidance of offending foods (and their odor) when nausea and heartburn occur. Many pregnant women find that spicy, fatty foods can increase problems with nausea and heartburn. Frequent, small, and blander meals are often better tolerated. Some women find eating dry crackers before rising from bed in the morning helpful for nausea. However, since nausea and vomiting usually subside by the end of the first trimester, they do not have a significant impact on the final weight gain in most pregnancies. Hyperemesis gravidarum, or intractable vomiting during pregnancy, can rapidly result in dehydration , so medical intervention is required. Breastfeeding is the recommended method of infant nutrition, with a few exceptions. It benefits both mother and infant by providing protective antibodies to human disease, and breastfed babies are generally healthier and have higher I.Q. levels than bottle-fed babies. The development of jaw alignment problems and allergies are also far less likely in breastfed babies, while mothers who breastfeed have less postpartum complications and are considered to be at lower risk for breast cancer . SEE ALSO Adolescent Nutrition ; Breastfeeding ; Low Birth Weight Infant ; Pica ; Small for Gestational Age ; Women's Nutritional Issues .